According to Min, who happens to be a huge fan of Indian foods, this place gotta be the best Indian restaurant on earth. 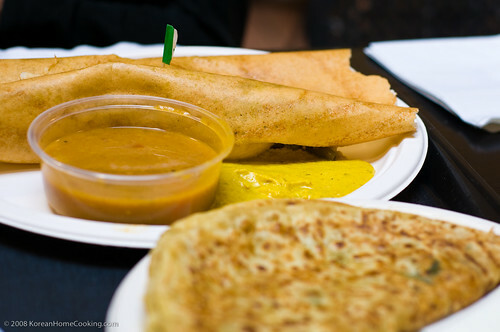 Well, we haven't been to India yet, so let's say it's one of the best in the West coast or in the SF Bay Area at least. Vicks was so goo...d. I used to not like Indian food, but my taste has changed and I've gotten to enjoy it very much over the time. And, I agree this place serves one of the best Indian foods ever. The place looks more like a big food court than a restaurant. When we went there, it was full of people on Sunday afternoon. There were lots of Indian people along with non-Indian people like me. I think that's a good sign because it's an indication of authenticity :) The price was very affordable, and the service was very prompt and straight forward. We peeked at side tables to get some visual hints for our menu choice. They all looked very good. We narrowed down to some three choices. I forget the names of the foods we ordered. A crepe-like bread with some bean-based curry was very good. So were vegetable and lamb samosas.